As protectors of the official court record, Wisconsin court reporters need to be trusted that they will present information accurately – those transcripts could live on and be referenced for many years after a reporter has moved on. What some might not know is that not every statement from trial makes it into the official court record. According to Rosalie Kramm, a court reporting blogger, in some complex cases, such as those involving intellectual property, involved parties are wary of information regarding a deposition entering the public domain. If court reporters are told that all or part of a transcript is to remain confidential, only for attorneys to see, they need to be sure to designate the document, or parts of it, as such. 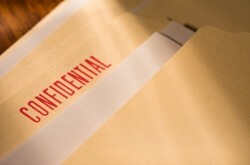 When only certain parts of a transcript are confidential, court reporters should note on the cover of the transcript which sections are designated as such. This way, there is no confusion and notes within the document about confidentiality cannot be overlooked. "Court reporters who write patent, trademark depositions typically work extremely hard, and most of the depositions are expedited with video," Kramm wrote. "They are extremely stressful and difficult jobs to get out. This post is a helpful reminder to all of the great court reporters out there. Designations are critical." The stakes are high when it comes to confidential parts of court records. The best Wisconsin court reporters, trained by experienced agencies can be trusted by all involved parties to produce accurate records. Kramm says that if court reporters make mistakes related to confidential documents, not only will they taint the proceedings, they could open themselves up to a lawsuit. This entry was posted on Thursday, February 28th, 2013 at 3:54 am	and is filed under All Posts, Court Reporting News. You can follow any responses to this entry through the RSS 2.0 feed. You can skip to the end and leave a response. Pinging is currently not allowed.